The New York Knicks are counting on Patrick Ewing to be their good luck charm at next month’s NBA draft lottery, according to ESPN. Ewing, who was New York’s last first overall pick has been tasked to represent the franchise in hopes they can land NCAA superstar Zion Williamson. The 11-time NBA All Star alluded to this promotion on his Georgetown radio show Thursday. Ewing is asked about how often he gets asked about Zion or KD coming to the Knicks, he says "all the time" and then says: "There's a secret that's going to come out in a couple of weeks, but I'm not going to say it yet...They'll see when it happens." The Jamaican-born Hall of Famer played four years at Georgetown University before becoming the Knicks’ No. 1 selection in 1985. During his tenure in the nation’s capital, Ewing led the Hoyas to their first and only championship title in 1984, and was named the tournament’s Most Outstanding Player. 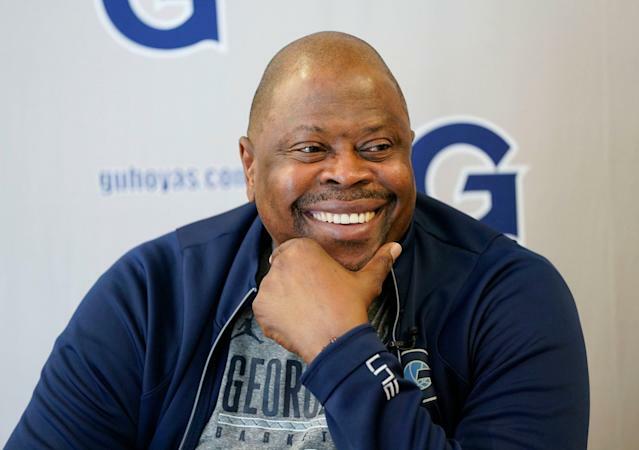 The 56-year-old now serves as head coach of the Georgetown men’s basketball team, a position he has held since 2017. The Knicks finished this year with the league’s worst record at 17-65, so they will select no lower than fifth on June 20. While he hasn’t officially declared for the draft, Zion’s freshman season at Duke puts him at a promising position to go number one overall. Through 33 appearances for the Blue Devils, the 18-year-old averaged 22.6 points, 8.9 rebounds, 2.1 steals, and 1.8 blocks per game.